I am a bicycle snob. I'm at a point where beauty and function generally win out over comfort or financial considerations. This is where non-cyclists start to get really confused. Deep down, riding a bike is about sacrifice, and that's not a popular starting point for most people. There's usually a faster way to get where you need, or a drier one, or one that causes a bit less hardship and pain. But the combination of physical challenge and childlike entertainment makes a bicycle a special thing, and this leads to a cascading series of strange decisions. Eventually, you end up riding around on tires that are too skinny, with bars that are too low and a saddle that is too hard. But we revel in this. We love the confusion in our coworkers when we show up for work late, soaked to the bone and exhausted. We love it when they shake their heads, muttering about our grease-stained pants. The more confusion we sow in others, the more certain we are in our feelings. There's a masochistic pride in our ability to do something that others can't (or don't want to). And I think this is why the cycling community has not embraced e-bikes. That's an understatement, really. In the cycling pecking order, e-bikes reside somewhere just above a recumbent, but just below driving around with the AC blasting out the open windows of our diesel belching pick-up. They're a thing that you look sideways at while at a stop light, or roll your eyes at when they blow by you up a hill. Yes, we can all see that the rider is getting there faster than we are and with less effort, but that's missing the point. You're supposed to be suffering! It's not meant to be easy! The ease with which these outsiders move about town takes away from this crazy thing that we've poured energy, time and dollars into. 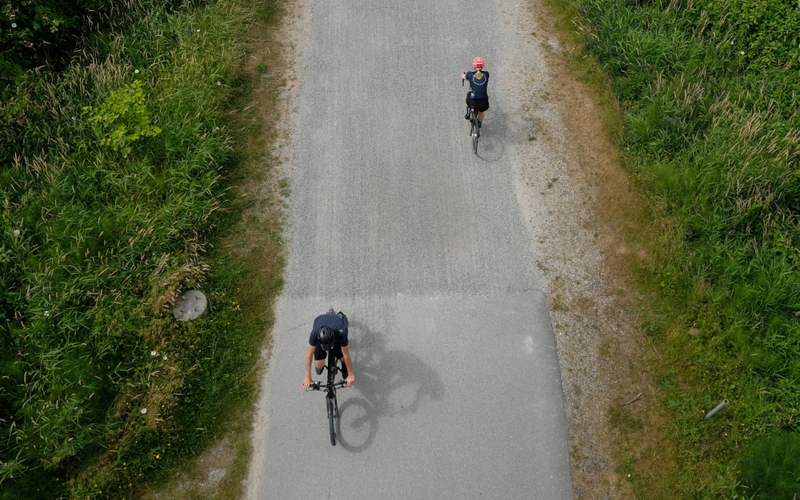 Even if most of our cycling takes place solely in our imagination, somehow our twice monthly, fair weather bike rides push us right to the top of that mythical cycling hierarchy, high above the lowly e-biker, pounding away each day like a madman, rain or shine. Somehow, they haven't earned it and it's not good enough. And here I was about to become one of them. I didn't want to. I had to. The new job was so very far away and I knew that I didn't have it in me to consistently commute by bike. I mean, it was hard enough to summon up the energy when it was half the distance. Throw in an earlier start and my resolve would be crushed by the lightest 6AM drizzle. Maybe an e-bike could change this? Could I close the gap enough between the time it took to drive and the time it took to ride? Would I more often make the call to ride to work? This seemed worth finding out, and I finally had an excuse to look into it. Trek's Super Commuter series does a lot of things right, and most likely comes in a flavour legal in your jurisdiction. The Super Commuter 7+ that I received is "pedal assist" (it only provides assistance when you pedal) that tops out at 32 km/hour. It's a bit frumpy, but looks more-or-less like a regular bicycle, with the battery hidden in the downtube. The giant tires, rugged fenders, rear rack and lighting built right in turn it into an assault vehicle for a mid-life crisis. I was ecstatic that they agreed to lend me one, and after a tiny bit of de-kookifying (kickstand and reflectors off...saddle swapped...a few other bits cast aside), it was ready for action. My expectations of my first ride far out-paced reality. The bike does move quickly from a stop, but I was surprised just how soon that 32 km/hour speed limit sets in and just how slow it felt once it did. It was almost like...I don't know...a regular bicycle? Worse, everything I did seemed to battle with the bike. If I pedalled normally, I'd be continually bumping up against the speed limiter, herky-jerkying down the road, which did not feel great. Fairly quickly though, I adjusted and started to appreciate the finer points of how it worked. If I eased off my pedal stroke just a touch, and focussed on a smooth, consistent cadence, the bike and the electronics started to work together quite well. Coupling the nice little Trek touches with a shift in my mindset, and this became a kickass way to move about. It allowed me to ride around town on a bicycle the way that I think I ride around town on a bicycle. That is, with ease, grace and style. The range of "fun moments on a bike" expands, and the times where you question why you're bothering to do this diminish in number. Indeed, I began to dread the times when I was forced back onto my more fashionable commuter. The skinny tires were punishing and provided far less confidence in most conditions. And my position was uncomfortable enough that I started moving things around to find something that better matched the Trek. Looking good while suffering began to seem unappealing. But more on that later, along with some numbers and other conclusions. Dave Tolnai is from Vancouver and writes about bikes. You can catch him every few weeks at NSMB.com.